Special thanks to Ruth Rollitt for the one – yes, you read it right….this is none other than the Eastern Hotel. This was taken in the 1940s; according the Ruth, he father (Danish architect B M Iversen) had an office here. Today, the facade seems so different – and the hotel is now known as D’Eastern Hotel (last I checked)! This hotel was renovated in the early 70s. Further down the road just before Lido cinema was the first KFC franchise outlet in Ipoh. I can still recalled a famous bar, probably beside KFC. Sydney Bar?? 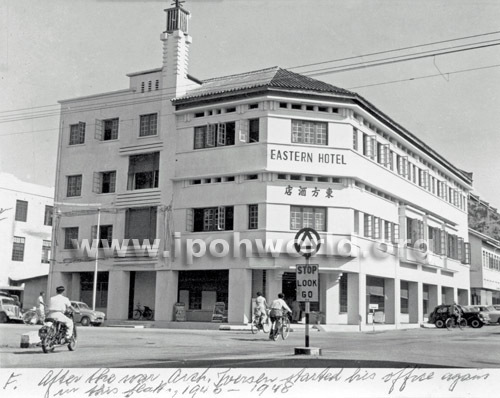 ?.Opposite KFC was the old ABJ coffee house.It was a good place to hangout during the weekend or after midnight show at either Lido or Cathay.The Eastern hotel was probably a 4 star hotel ( by Ipoh standard), after renovation. I spent many a late Sunday evening in tha ABJ , as you say, after going to the cinema. Always ordered the chicken curry. Happy days!! I think it was the Oasis Bar, next door to Dorice Institut de Beauté. My mom used to have her hairdo and facials done by Dorice Ong. While we kids waited patiently, one of the shampoo girls would go fetch us ice cream from Oasis. During the advent of ‘UK trained unisex salons’ in the late 70s, Dorice’s popularity was on the wane. Oasis was definitely the only hang-out for floats and sandwiches. Dorice Ong passed away at the ripe old age of 90’s. Memories! Evan, welcome to our world, ipohWorld and thanks for the details. They are all new to us and very welcome. Hop to hear from you again soon. I miss Ipoh after spending 13 yeare of my life …1946 to 1959 after which I returned as a soldier based in a camp on Ashby Road.Used to visit Sydney Bar and Lido Cinema quite often.I now live in Germany for the last 45 years !! You don’t happen to know where H.Q.R.A. is in 1946? And what does it stands for? Welcome to the blog, John Baker! Just to let you know, the army camp is still along Ashby Road (the road name has been changed to Jalan Raja Ashman Shah, previously known as Hospital Road). By the way, where was Sydney Bar? Chuah TC, H.Q.R.A. would be Headquarters Royal Artillery. Anybody who has more information about H.Q.R.A. in Ipoh(?) in 1946, please share. I couldn’t find anything via a Google search.